On the moon there is also a mountainous formation called the Alps, located near the crater Plato (or Plato, in English) in the northern hemisphere of the satellite. The lunar Alps were formed not as here, by the collision of two tectonic plates (the African and Eurasian) but by the impact of a meteorite on the lunar surface. 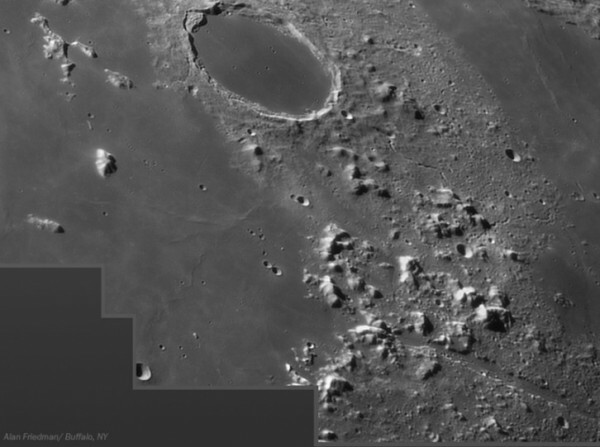 After the shock of great magnitude, incandescent lava from the crater along the Mare Imbrium (more rain), whose name is due to formerly thought (by color) that were seas, as on Earth, it was what formed These “mountains”. That is, it is due to the collision and the incandescent lava. It is assumed and as the pieces are scattered, that lava was thrown out of the moon, falling post this eastward. Your name, the lunar Alps, is due to the similarity to size and elements to terrestrial Alps, with 160 kilometers long and 10 meters wide and having a mountain called Mont Blanc 3 kilometers high (equal than Earth).